Parents have the ability to provide information about their campers' Authorized Pickups through their Parent Dashboard account. Only First name and Last name are required. All other fields can be made "Active" and/or "Mandatory" under Admin>Campers>Attendance. 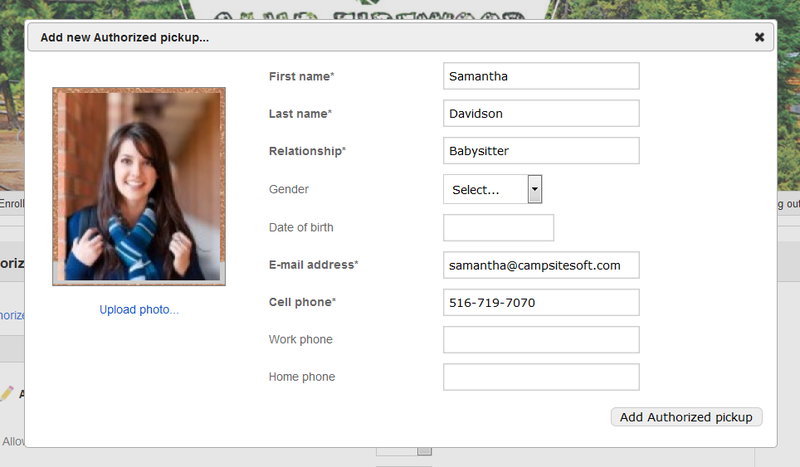 If required by camp, parents will also need to upload photos of their authorized pickups. After providing the necessary information, click Add Authorized pickup. The new Authorized Pickup will be added and automatically authorized for the current enrollment year. Clicking on the name of the Authorized Pickup will allow parents to update contact information, or remove their authorization for the current year. Note: If your camp allows families to indicate their child may check themselves in or out without an adult, an additional setting for each camper will appear on this tab.